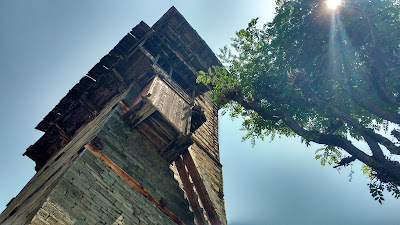 Chehni Kothi is something that at casual observation looks like a defensive watch-tower. 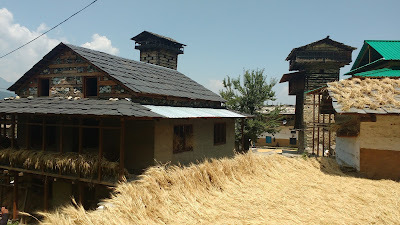 It is, however, also a kothi (granary). The architecture is something that can be called as Indo-Tibetian - of course I'm no expert and there are far more specific terminologies used to describe this place, but for the sake of simplicity I'll prefer this. 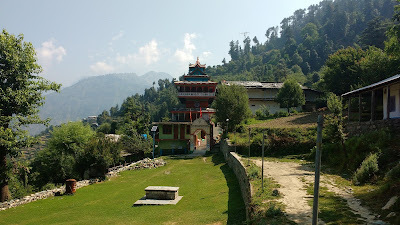 The tower is located in the Chehni village - hence the name - perched up on the right-bank of the Seraj Valley overlooking Banjar below, Chach-Galu Top on the other side and sections of the Tirthan Valley towards north-west. We did this small hike during our stay at Jibhi in June, 2016. 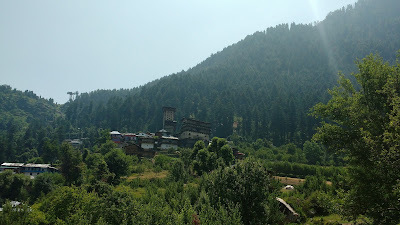 The Chehni village is approached via the Jalori Highway. 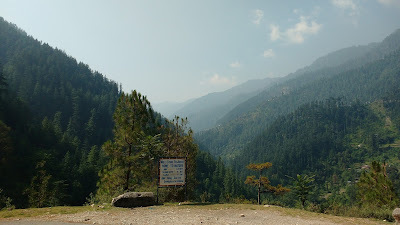 The route to the village forks from the highway at a point almost equidistant from Jibhi and Banjar (4km each). A metaled road ascends for a further 2km to the lower reaches of the Baghi village. Very few vehicles ply on this route. We were lucky to get a drop in a taxi heading to pick up early morning commuters to the markets. School-buses can also be tried for lifts. Beyond this point, the dirt track is only fir for 4x4 vehicles. 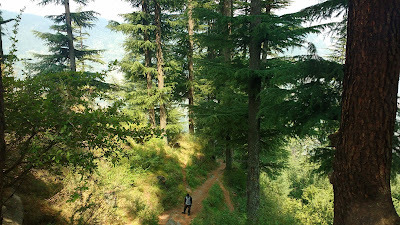 A staircase starts at this point and a hike of about 1km on takes us to the Shringa Rishi Temple of Baghi. The Chehni village is a further 1km away. 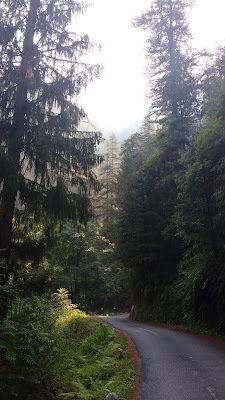 The ascend of the switchback trail is not very steep and can be attempted by moderately fit people also. 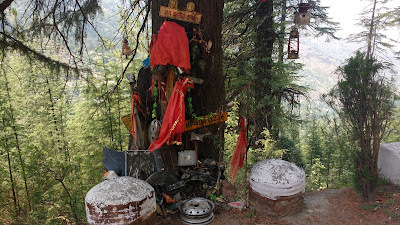 Shringa Rishi is one of the palak devta (guardian God) of the Seraj Valley, the other being Balu Nag. The temple is much revered and offers brilliant views. 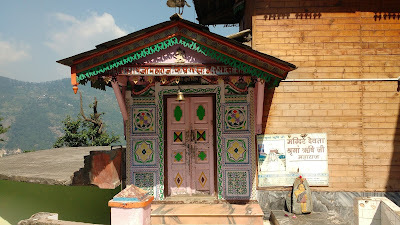 The temple is multi-storeyed and intricately decorated. There is also a large cow-shed next door. 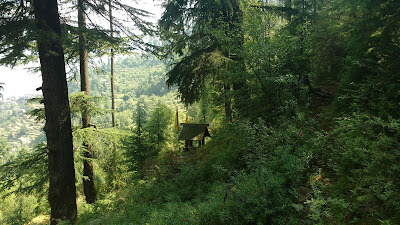 There was a procession of Shringa Rishi to Ghiyagi up the valley a day prior to our trek. Hence the temple was closed for the time. 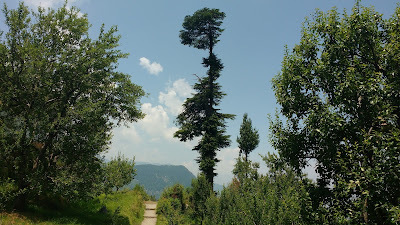 Hiking trails in the Himalayan altitudes tend to leave you short for breath. We had been hiking for about 30mins on what what was supposed to be a 20mins trail and were without any sign of the village. We decided to take a 15min break under the shade of a small boulder along the way. It was not required though, for the moment we stepped out of the shadow the village presented itself in a splendid sunlit glory. 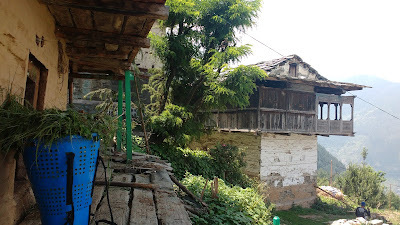 The village is small and signs of typical village life are visible as one walks through the narrow lanes that lead to the Krishna Temple and the Chehni Kothi next door. 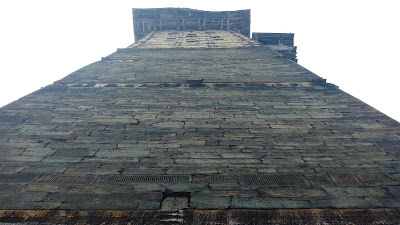 There's also another smaller tower next to it of a similar structure. The lower structure of the Kothi is made of stacked-up rocks reinforced by wooden beams. 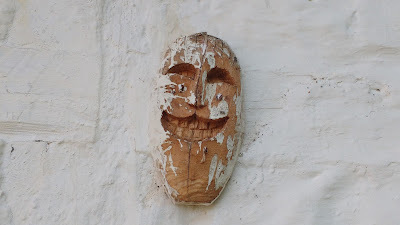 This is the granary. Little sparrows could be seen flitting in and out of the small gaps in the rocks. The upper structure is made of wood and probably houses a temple. Two parallel carved logs make up the staircase that leads to the upper structure. Access is strictly restricted. We waited a while at the village and then started our descent to the main highway. It appeared that we were the only people on the road at that time of the day and had to walk the entire 8km back to our guest house in Jibhi. This mostly downhill walk was a bit tiring, but the views made up for it.